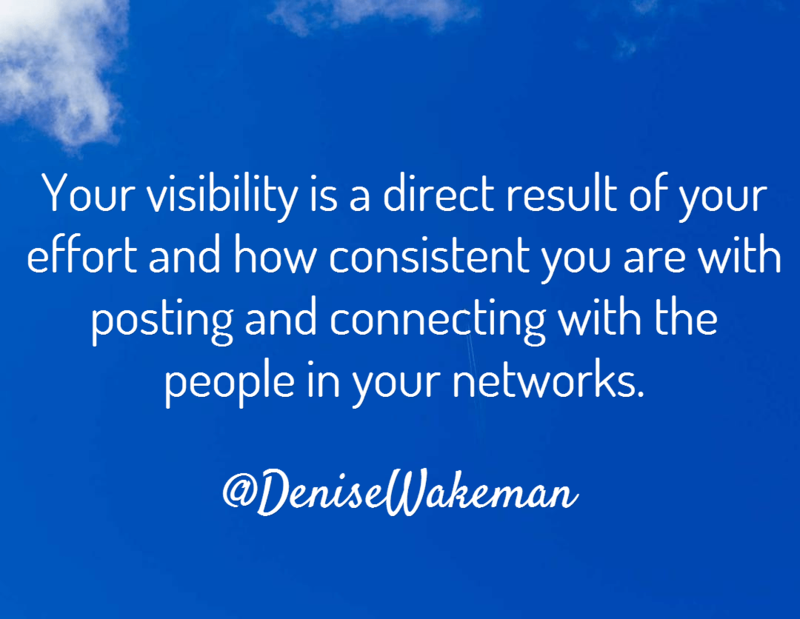 Ask Denise - How Often Should I Post to Get Visibility? The first thing to get out of the way is that there are no rules and everyone has an opinion. There is no “right way” or right time to post. It’s tempting to want to follow someone else’s formula, and that’s great for a guideline and setting up your initial schedule. Ultimately, though, you need to test and experiment to find what works for your followers AND what you can comfortably sustain on a consistent basis. Then you have to tweak and test some more. The second thing…you need to be clear on your goals for social marketing and the outcome you’re looking for as you build your visibility on the Web. All this depends on what’s happening in your business: are you launching a new product or service? Are you building your list? Do you want people to register or buy your thing? Or, are you in a phase where you primarily want to build awareness for your business? Finally, the third thing is that building visibility is about more than posting (your own and curated content) on your social networks. What is going to help you stand out is how much you engage on with the people in your networks. Do you reply to comments? Do you read, like, comment and share the content of others? If you drop a link into a status update, move on and never return, you will not be visible for long and your community will move on. Let’s get back to Trudy’s question: how many times a day do you have to post to get visibility? Trudy doesn’t ask about a specific network and each one has it’s own flow and character. I could be flip and simply say, “It depends” but I’ll take it a little further and tell you what I generally recommend when working with my clients on this question. 1. Decide how much time per day you can commit to spending time on your networks. 30 minutes is a good place to start. 2. Pick 2-3 networks where you know your ideal audience spends most of their time. Survey your list or social contacts to find out. 3. Focus most of your time on those 2-3 networks, even if you’re active on more. To build awareness you need to be consistently offering value and rather than flit from site to site, focus on a couple for a month or two, then add another layer. 4. To make things simple, use the 80/20 rule. For example, if you post 5 times per day on Twitter, 4 tweets should be sharing others people’s content (OPC) and 1 tweet your own content. Track how many comments and retweets you get on the posts. Do more of what works. Use a tool like Hootsuite or Buffer to manage your status updates. 5. When sharing your own content, think about how many ways it can be repurposed and shared: a blog post can be shared on all networks as a link; create an image for your blog posts and share on Pinterest, Twitter, Facebook, Instagram, LinkedIn and Google+; excerpt a couple of quotes from your article to create a new round of tweets and status updates with a call to action to read the full article. There have been hundreds of studies and analyses about the best frequency for posting. When I did a Google search on the question: how often you should post on social media, I got back a whopping 11,900,000 results. This question has been asked and answered a lot! I reviewed a few of the recent articles and found the post by Kevan Lee on the Buffer blog, The Social Media Frequency Guide, to have good info referencing a lot of studies. I recommend reading the entire post to get the reasons why, but if you just want to skip to the Takeaways at the end, you’ll have a place to start your own experiments. How often do you post on the various social networks and are you getting the results you want? Do you have a question about online visibility or social marketing that you would like answered? Click here to send me a message with your question. Why do people look at social as an ‘immediate result’ marketing avenue, when no other branding campaign is? The reason that you click on a social post is a combination of many things, but one is that you enjoy the writer, or the source. Give yourself six months using this great infographic, and you will ramp up to 30 minutes per day, all of the time sharing better and better information.